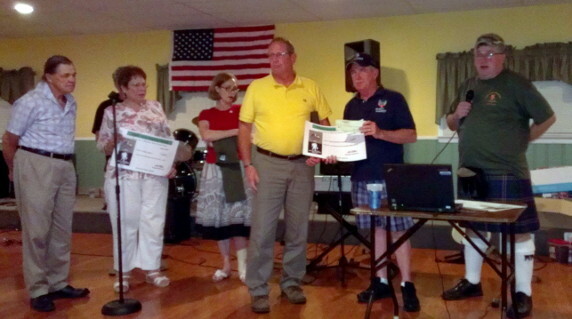 Division President Jack Sullivan and Wounded Warrior committee chairman Jim Shaw present checks to local Wounded Warrior groups and family members. Monmouth 2 worked through out the summer to raise $14,000 for Wounded Warrior Projects. This money was raised through a golf outing raffle, highway collections, a fund raiser night, and other donations. This money was used to send a team & donation to the Bergen Tank Pull event, sponsor several local Wounded Warrior charity groups, and also make direct donations to local wounded servicemen. The funds helped these soldiers to offset expenses like a handicap vehicle and renovate a home for handicap access. On Friday, August 3rd, the Division held a fund raiser night to raise a bit more and to present checks to representatives from the soldier’s families and the organizations. The event was also used to collect comfort supplies that were sent to our troops in Afghanastan and supplies for the bomb dogs that are protecting them.